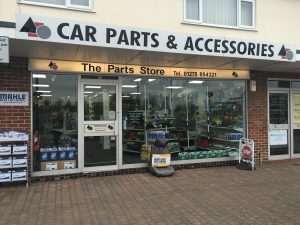 The Parts Store in Nailsea are stockists and distributors of motor spares, car accessories, DIY car maintenance, hand tools and vehicle number plates. With an extensive stock and an experienced motoring sales team your can visit our store or local garages can have the parts delivered direct to their premises. The Parts Store Nailsea – Dedicated Motoring Specialists. You’re up to your ears in workshop or body repairs, you need parts fast and you can’t afford to lose valuable time going out to get them. With The Parts Stores extensive stock, unrivalled local expertise and an exceptional delivery service, the parts that you need will be with you when you need them. The Parts Store offer a daily delivery service to local garages within Nailsea and surrounding North Somerset villages through Parts Stores own transport fleet. The Parts Store is the first choice for motorists, motoring enthusiasts, workshops and motor garages. Choose The Parts Store for all your motoring parts with local professional service – saving you time and money. Call 01275 854321 or email enquiry@partsstore.co.uk for all your car spares & motoring accessories. The Parts Store aim to supply all the car parts and motor accessories you need, whenever you need it.